Davos, Switzerland often feels like our home away from home in Europe. It’s the first World Cup venue we go to after starting the season in dark Scandinavia. The mountains, sunshine and snow is something we dream about through November. 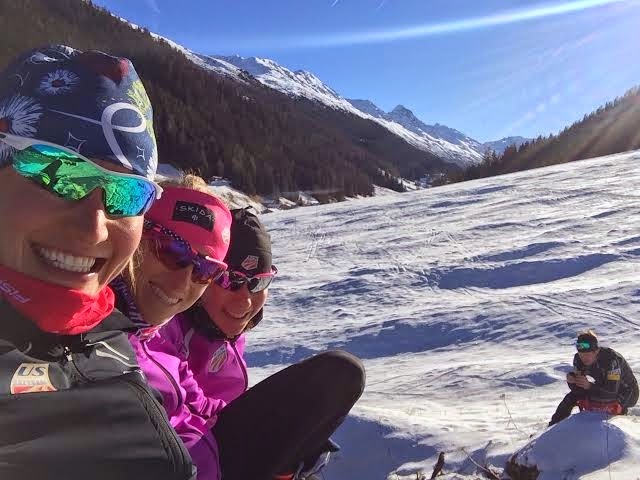 This year I was planning to be here for 12 days but after a poor snow year in Europe plans were changed and I’m spending 24 days in Davos, first for races and then for the holiday break before the Tour de Ski. But since there isn’t a Christmas song with lyrics for 24 days, I’ll stick to the 12 days of Davos. 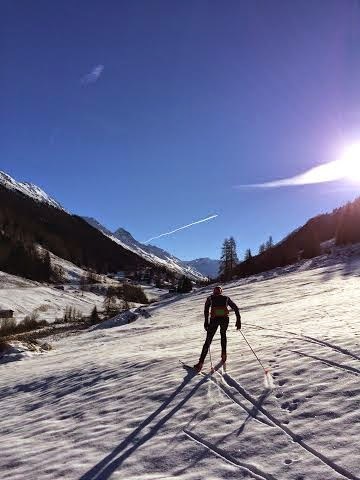 On the first day of Davos, Switzerland gave to me…. 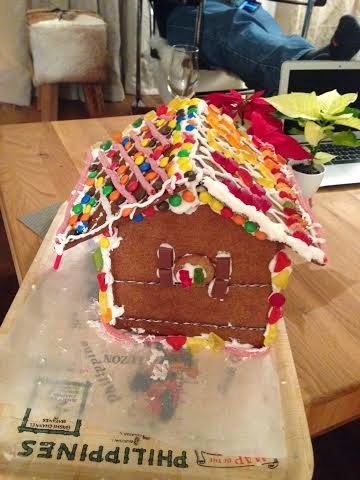 1 leaning gingerbread house- Even on the road and away from home we’ve had no problem being festive and finding Christmas spirit. We’ve made cookies, opened stockings, decorated with lights and candles, and yesterday afternoon we had a blast building and decorating a gingerbread house. It’s not quite straight and has LOTS of sugary frosting holding it together but we built it totally from scratch and it’s still standing! I think we are all expecting it to topple at any moment but it’s still standing! 2 Skate Sprints: After the World Cups in La Clusaz, France were canceled, Davos took on the challenge for a second weekend of racing. This meant we had back to back skate sprints on the exact same course! A uncommon opportunity to try something one weekend and then improve on it the next weekend.The first weekend, I qualified in 19th which was one of my strongest skate qualifiers ever. I finished third in my quarterfinal just missing out on a lucky loser spot into the semifinals to finish 16th on the day. The following weekend, I almost crashed on an icy corner in the qualifier and in such a tight field I figured my day was over. But luckily I just sneaked into the heats with a 29th place finish. In the heats I actually crashed, face planting a couple hundred meters from the finish when Norwegian Heidi Weng and I clicked skis. So I didn’t find the improvement I was looking for on the second try but each sprint heat is such a learning opportunity and the experience of aggressive head to head racing gave me some new things to focus on in my next sprint. 3 Meters of Snow! Just kidding it’s more like 3 inches or maybe 3 centimeters but it is enough to cover the ground so we can count it as a white Christmas. 4 Skis for Waxing– I spend most of the winter traveling with over 30 pairs of Fischer skis, ready for every snow condition and race course. It takes a full time wax tech to prepare the skis and keep the fleet in good shape and I feel extremely lucky to have an awesome staff of waxers on our team. They work extremely hard to provide us with fast skis and I must say it was really fun to tuck by a Norwegian in last week’s sprint. For this break we are on our own for waxing so I’m keeping it simple with just a pair of skate skis and a pair of classic skis. We’ve nailed the classic wax so far, even on an icy klister cover day and a day of heavy falling snow. But that said, I will be happily awaiting the return of our coaches and techs! 5 Kilometers of Skiing- There is a 5km manmade loop of skiing in Davos right now which was prepared for the World Cups and is in great condition. We spend most of our time training on this loop but last week we took out our rock skis for a crust cruise up Dischma vallley or “Sunny valley” as we like to call it. The coverage was thin in spots but it was a blast! 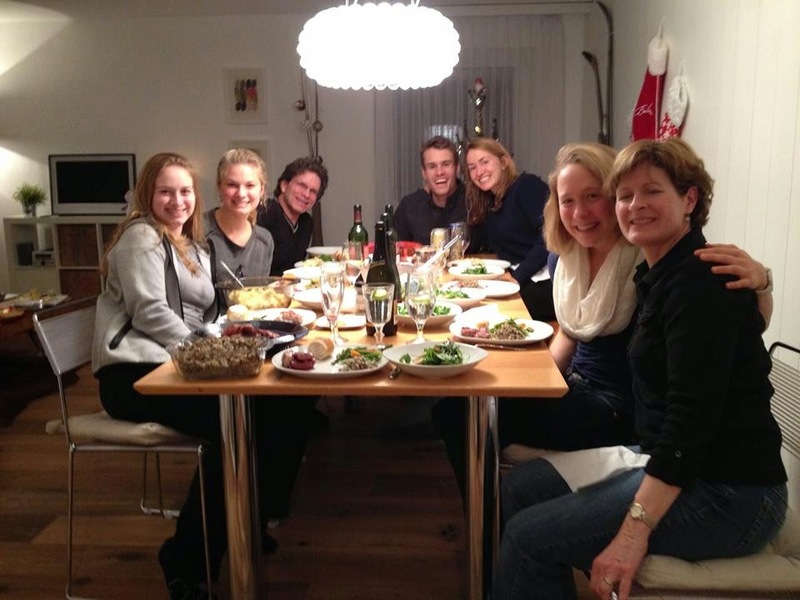 6 Americans in Davos- Liz Stephen and I are renting Anna Haag and Emil Joenssen’s apartment together that is sitting on the ski trails so it couldn’t be a nicer spot for the holidays. Simi Hamilton and Sophie Caldwell have an apartment just a few minutes of skiing away. Jessie Diggins’ family is here also staying close by and Kikkan Randall and her husband Jeff Ellis are staying in the hotel where our team stayed for the races. 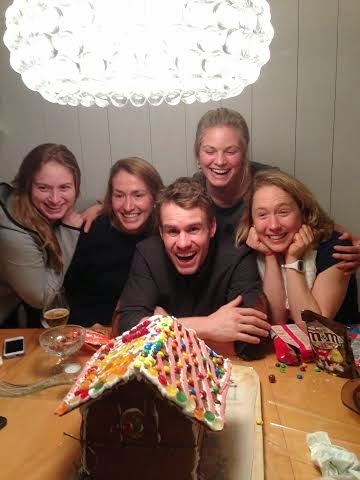 It’s great to have so many teammates around to spend Christmas with away from home! 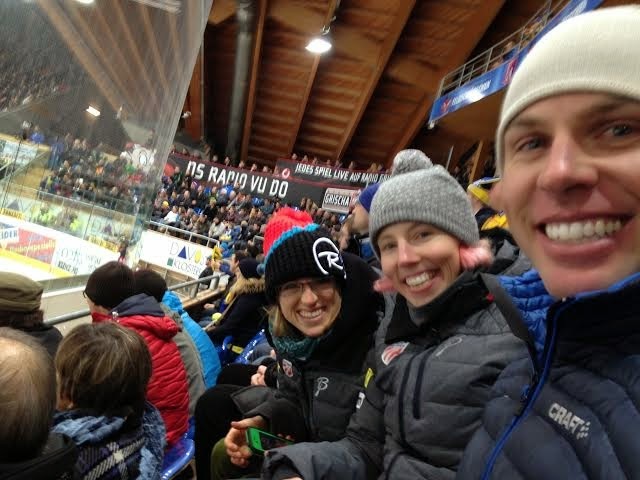 7 Hockey Goals- Jeff and Kikkan had connections in the Davos WC organizing committee and got the team tickets to a Davos professional hockey game. We were in the second row directly behind the goal! 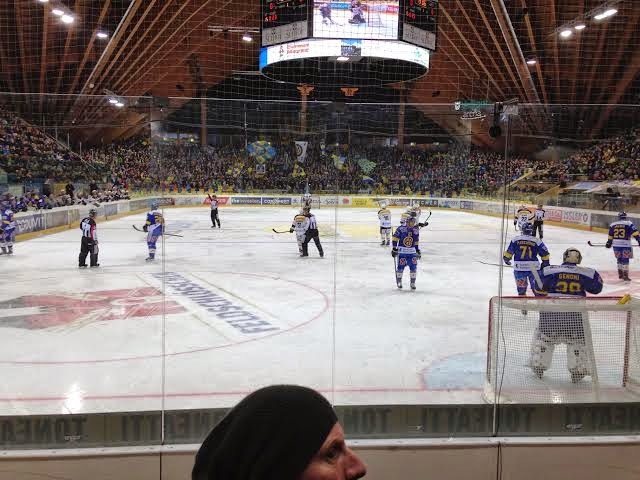 The play was very fast paced and exciting and Davos ended up losing 4-3 in a shoot out after regular and overtime play! 8 Pancakes for Breakfast- It has been a very nice change to have a kitchen and to cook for ourselves. While we can’t ever complain about having meals prepared for us, cooking is fun too and it’s always nice to choose what you want to eat. We immediately prepared spicy food with dinners of chicken curry and mexican. We also had an incredible pancake breakfast our first morning here with stacks of pancakes topped with yogurt, maple syrup, fruit salad, and brown cheese from Norway. 9 Days to Change the Race Venue- There is a new FIS rule this year that venues have to make the call nine days prior to the first competition for whether there will be enough snow to hold the races. And with very limited snow across Europe, this rule has been called into use. 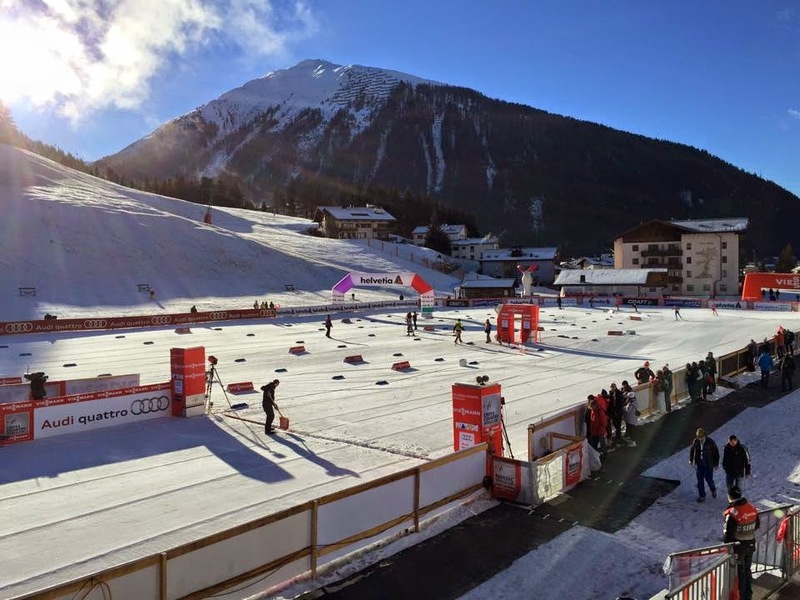 It was uncertain whether Davos would be able to hold any races here but slightly cooler temperatures arrived and the race organizers were able to make snow on top of a pass and truck it down to the race course! A huge thanks needs to go out for all the work that they put into making these races happen. And then nine days before the La Clusaz, France weekend, those races were cancelled and Davos stepped up to host a second weekend in a row! There were rumors that the Tour de Ski was also in jeopardy but now since we are less than nine days away, we’ve received official word that the Tour is on as planned! 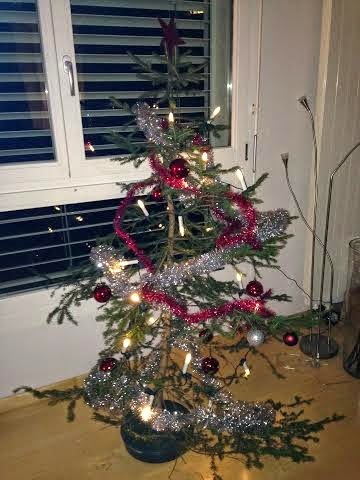 10 Tree Branches- Here’s our Charlie Brown Christmas tree that actually reminds me of a smaller version of Christmas trees I’ve had at home. 11 Extended Family Members: I miss being home with my actual family for the holidays but as Christmas orphans we have been taken in for quite a few wonderful meals and the recipients of incredible Swiss hospitality. We had homemade pizza for lunch with Esther Bottomley and Valerio Leccardi after a long ski one morning. 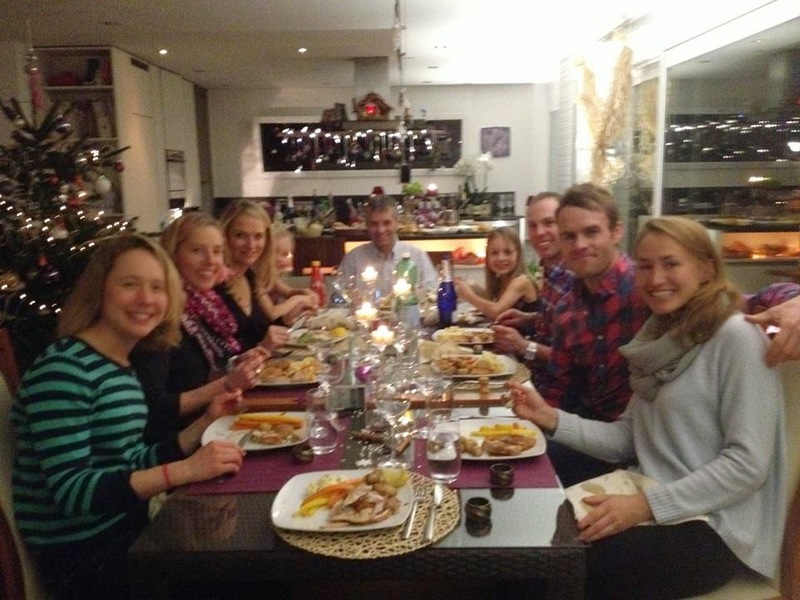 For the second year in a row we had Christmas eve dinner with the Capol family who live 45 minutes from Davos. And on the 25th the Diggins family invited us over for a delicious Christmas dinner. Thank you to all for such wonderful hospitality and making us feel at home here in Switzerland. Christmas Eve with the Capol family where they cooked a turkey for us so we would feel at home! 12 Days of Training: There are exactly 12 days off between the last World Cup in Davos and the start of the Tour de Ski. This is a pretty long break from racing for us so it’s nice to have an opportunity to train a bit and prepare for the rest of the season. In normal race weeks we are focused on the weekend races so it’s nice to have the opportunity to do what we all love and just go out and ski! Happy trails! Clare, Ethan, Mike and I just left Minnesota, where we were competing in a 4 day race series of IBU Cup Trials. The site of the trials was Mt. Itasca, a small ski club in Grand Rapids, Minnesota, which is WAY UP THERE in Minnesota, about a 3.5 hour drive from Minneapolis. Unfortunately, there wasn’t much snow in Mt. Itasca to begin with, and the rain we got on the second day of racing didn’t help. But the organizers did a good job providing a 2.5k (ish) man-made loop that held up remarkably well throughout, and a little bit of snow and cold temperatures on our last few days made for great skiing just before we left! Turns out, you don’t really need a big loop to hold biathlon races, and the loop didn’t even get boring on training days when you had the anticipation of shooting every round. These trials were my first real, on-snow, biathlon races so I wasn’t expecting much in terms of results, but it was great to see my teammates put together some solid races. They’ll announce the teams for IBU Cups (the level just below the World Cup) soon, so fingers crossed that the GRP will have a representative!! We raced 3 sprints (7.5k for women, and 10k for men) and one mass start (12.5k for women, 15k for men). The weather and scenery didn’t inspire me much to take pictures, but luckily one of biathletes from Minnesota, Jakob Ellingson, is also a talented photographer so all of the race shots are from him. It was also the only day the sun came out during our entire 10 day stay, so we were happy to have sunshine and perfect skiing, along with the signature Mt. Itasca chilly weather… brrrr! Tucking, and trying to not let my rifle hit me in the head! Clare won the final sprint! 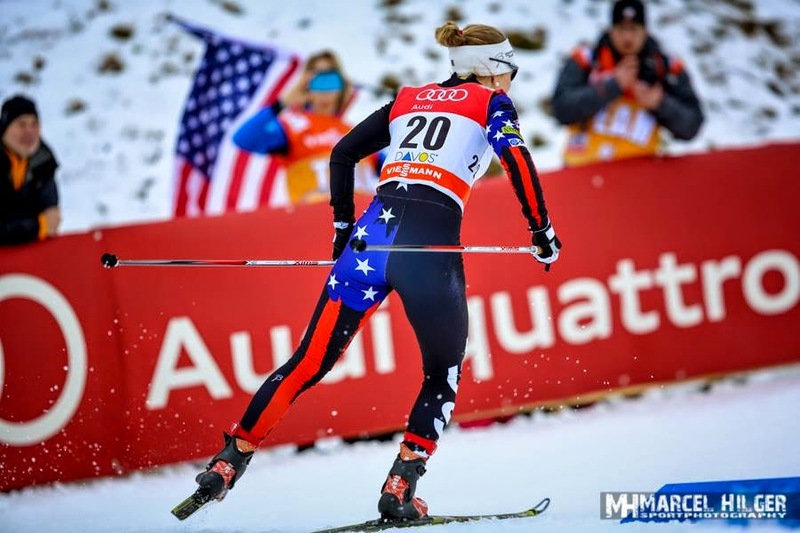 We haven’t heard yet if she’ll be named to the IBU Cup Team, but we have our fingers crossed! The skiers returned from Montana to Craftsbury last week, on Tuesday, a day that also marked the beginning of a week of falling trees. Tuesday morning or afternoon (I’m guessing, since I wasn’t actually here) it started to snow, and by the time we landed in Burlington at about 5pm, there was a thick coat of slushy wet slop on the ground with more falling. During the drive to Craftsbury the precipitation turned decidedly more solid, but still wet and heavy, huge flakes and clumps of snow. All of us were relieved to make it safely to Craftsbury, and we settled back into our house and fell asleep amid a continuation of the storm. The next morning I remember waking up a bit of rain/sleet on the window, and noises of wind, but nonetheless a beautiful wintery landscape, complete with snow-pasted trees and deep banks of white. As we prepared for a morning ski, an email message came through from Pepa informing us that there were many branches knocked down onto the trail and it would be great if we could help pick up some of them while out skiing. From our house, nothing seemed particularly out of place, though the trees had an above average amount of snow coating branches and trunks. However as soon as a few of my teammates and I entered the woods on our skis, it became apparent what the storm had been like – branches all over the place, big clumps of small sticks protruding from the middle of the trails like pins in a pincushion, and larger branches strewn about, and an occasional entire tree across the trail. The groomers were only able to take the machines around a few of the small core-trail loops, and even that I’m sure took considerable clearing. Beyond the few short loops of freshly groomed trails, all hands were on deck cleaning up the rest of trails. Kaitlynn and I skied a few of the core trail loops, and then ventured out onto Ruthie’s Run, which took a record-long time to ski around, between the constant pick-up-sticks and ungroomed 8+ inches of snow with an icy and grabby top crust. We counted big trees down on just Ruthie’s out and back trails – chainsaw-worthy trees – and our count reached 12 by the end, in addition to at least 15 small trees (actually mostly tree-tops), and at least 10 bent-over trees that would need to be cut or helped to straighten. As it turned out, it wasn’t the bit of wind that accompanied the original storm that caused most of the problems – it was the weight of the heavy, wet snow that coated all the trees. Because Day One of major tree clean-up was followed by Day Two, and beyond… It seemed from reports that easily as many trees fell the night after the storm as the night of the storm – collapsing under the weight of the snow, tipped over the edge of their breaking points by more snow that continued to fall. We’ve had intermittent power outages at the Outdoor Center and the GRP houses since Tuesday night. On the second major clean-up day, I joined the crew out on the trails for the afternoon, dragging branches and trees and picking up countless sticks. Ruthie’s Run had been completely cleared the day before, but we spent 3 hours with 7 people out clearing it again. View from the back of the Pisten Bully after the trail has been cleared – it’s a little messy with tiny branches and bark left behind, but really nice skiing! Thanks a ton to the grooming crew including Keith, Lucas, DJ, Eric Schulz, Eric Hanson and all of the GRP athletes and everyone else who put in hours and hours clearing the trails and making them skiable again so quickly! And for operating the generators when needed and keeping the Outdoor Center going! The rate of trees falling seems to be finally declining, and hopefully we’re nearing the end of power outages too, here a week after the storm. It’s still wise to be a little bit extra cautious on the trails when rounding blind corners, you never know what might have fallen down since the last time you skied the trails! Throwback to the women’s team in West Yellowstone, Montana – we haven’t seen much sun in Craftsbury, but wintery, snowy landscapes make me almost as happy as sunshine and the smiling faces of my teammates! This week has been a bit unusual, but I’ve actually enjoyed it, and we fit in lots of great training sessions! And one more photo from Montana! Awesome wax techs Bryan Cook, Nick Brown, Brayton Osgood (L to R) in sunny Bozeman, where they nailed kick and glide for our classic race weekend! Thanks guys! It’s been a little while since the Bozeman SuperTour races wrapped up last weekend, but I have a bunch of good pictures from the races that I wanted to share, so I figured it’s never too late for a post! The GRP skiers raced a classic sprint and a 10k/15k mass start in Bozeman. Conditions on the course slightly resembled an ice rink: warm temperatures during the day and freezing overnight made for some scary downhills on the twisty-turn-y course. Luckily, it also made for really nice klister skiing, and our 3 wax techs for the weekend, Nick Brown, Bryan Cook, and Brayton Osgood gave us fantastic skis for both days. Thanks guys! It was great to be skiing in the sunshine and mountains, even if we did have to practice our best alpine turning techniques. Check out our website for full race reports and results from the weekend, but highlights were Caitlin Patterson’s 3rd place in the classic sprint (and her first SuperTour podium of the year! ), Kaitlynn Miller’s 5th place sprint qualifier, Caitlin P’s 4th place in the 10k, and the fact that the GRP women were all in the top 10 both days! The top men’s result of the weekend was Gordon Vermeer’s 15th in the sprint. The skiers are now back in Craftsbury and enjoying the new snow, but also have been without power for a while due to the crazy storm and downed trees! Next up on the race docket: the opening Eastern Cup at Rikert in Middlebury. Thanks for reading, and enjoy the pictures!